Poured from 750mL bottle into a St Bernardus goblet. Bottled 10 November 2011. Best by November 2016. A: Light cream-colored head with cola-black body. S: Intoxicating. Boozy and ensorcelling. Whisky, licorice, a whiff of oxidation. T: Comes in roasted and sweet, heavy on the malted barley, toothsome with molasses and bourbon. Spicy, and very oaky. Aggressively woody and tannic. M: Not as thin as feared. Actually quite robust. O: A solid whisky-aged stout. I'm still not sold on cellaring, but this isn't hot at all. Quite nice. A: Black as night, licorice color with 1 finger creamy brown/beige head. slight bubbles piercing the thick head. Lasts longer than SKS, but similar lacing. S: bourbon first off, followed by similar flavors to SKS. Vanilla, chocolates, roastiness. similar complexity, but the bourbon is overriding some of the flavors. docking some points here bc of the overwhelming bourbon flavor. T: Tastes like roasted, dark chocolate, bourbon, vanilla, mellow oak, burnt malts, alcohol burn, and slight hop presence, less hops than SKS. M: slightly less carbonated, but similar mouthfeel to SKS. slight mellowness and also a bourbon mouthfeel (if that makes any sense) from the barrels but otherwise same mouthfeel. O: My first bourbon barrel aged RIS, and as a bourbon lover as well as a craft beer lover, it piques my interest. Sad that they are not making this anymore, as it is a worthy and widely available BBARIS. Slightly less enjoyable than SKS but that in no way makes it a bad beer as SKS is one of the best I have ever had of the style. Poured from a 750 mL bottle into a pint glass. Appearance: Dark Intrigue has a mahogany color throughout and is a little bit lighter around the edges. Not much head, although a bit of lace is left around the glass. Smell: Bourbon, anise, raisins, some oak, vanilla, and a bit of milk chocolate. Taste: The roasted malt is noticeable up front, along with some sweet raisin, fig, and chocolate notes, but the bourbon escalates very quickly. The woody oak and vanilla flavors ar mostly lost, as are any hoppiness or end flavors as bourbon dominates. The aftertaste is all bourbon. Mouthfeel: The body is full, but it dries out toward the end leaving my mouth full of bourbon residue. Medium to full carbonation, I would probably like it a bit lighter. Drinkability: This was disappointing. Not terrible, but the bourbon was overwhelming. Maybe it would be better with some time on it, after all, I did like Storm King better with a year of age. 750ml bottle poured into an oversized snifter. An initial pour of 8 ounces or results in a huge puffy tan head. Kinda fizzy, though, and within a couple of minutes it's a dense skim. Good retention from that. Not much lacing. A comparison with the notes from my Storm King review. Pretty straightforward nose- dark roasted malt, tiny bit of chocolate, bit of hops. Smells good, just not too exciting. The base beer can't keep up with the big boozy blast of the barrel aromas. On the positive side, some cookie dough and dark fruity notes are coaxed out. Flavor is also on the bland side. Dark malts accompanied by a bit of chocolate, a bit of coffee, a bit of hops. Again, the base beer isn't quite up to the challenge here. In the sea of booziness, the chief malty notes are tangy and bittersweet. Oddly, it's the surprisingly potent underlying bitterness that provides the most contrast to the booze. Body is on the thinner side of medium, but the combination of creaminess and moderate carbonation hides it pretty well. The thinness really hurts things. Seems a tad watery at the swallow. Huge alcohol burn in the finish, and then some barrel notes creep in. Smooth and about as sessionable as an RIS can be. Not sure if that's such a great thing, though, since there's none of the bold flavors I'm looking for in an RIS. Certainly neither smooth nor sessionable. The base beer simply isn't robust enough to stand up to barrel-aging. I reckon some cellar time would smooth it out a bit, but I'm not inclinded to spend my limited cellar dollars on that particular experiment. Pours a beautiful, dark black with a huge tan head. Great retention and big rings of chunky lace. The aroma is heavy on rich bourbon and oak with dark chocolate, earth, and roasted malts. Huge boozy bourbon up front throws the balance off. I have to compare this with other bourbon barrelled stouts, and it isn't balanced well. Nice underneath flavors of chocolate, coffee, roasted malts and bitter hops to balance....but too much roast and boourbon. Overall a little aggressive. Definitely a sipper. Pehaps will improve with some cellar aging. Pours pitch black and completely opaque with faint hints of mahogany edges when held to a light source and a 2.5 finger frothy, pillowy mocha head. Excellent retention, only slowly fading into a lasting cap that leaves chunks of soapy lacing behind. Complex aroma with lots of sweet boozy bourbon along with earthy oak, vanilla and silky chocolate malt. Slightly roasty with hints of oatmeal, toffee and coffee bean. Chewy medium body with a lot of silky chocolate and roasted malt. As expected, there is a blast of bourbon which is slightly hot but more sweet really. The oak barrel aging adds an earthy quality as well as a good amount of bourbon and vanilla. The vanilla presence smooths things out a bit. Lots of roasted malt with hints of caramel, oatmeal, burnt toast and dark fruit. Very complex but a bit too hot at this stage. I'm excited to see how it develops. A: Pours black with a small amount of chocolate brown head. S: Lots of Bourbon scents coming from this brew, some dark fruit flavors on the finish. T: Lots of Bourbon, Vanilla, Oak, roasted malt, dark chocolate, and some sweet dark fruit round out the flavors of this beer. I love the barrel aging of this beer as it mellows out a lot of the alcohol taste that Storm King usually has. M: Creamy mouth feel, not too much carbonation. D: I loved this beer although I am a bit of a homer because I enjoy Storm King a ton. I think that this beer takes Storm King to another level with a new complexity to the flavor but also fine tunes the original recipe as the barrel aging mellows it. It's a bummer that this was a limited release because everyone should try this beer, and I hope Victory does something like this again. 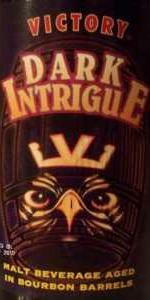 Pours dark as night from a 750 mL corked bottle with ABV and 'best-by' date on the label. One finger dark mocha colored head that dissipated fairly quickly to a thin film that stays. Aroma has notes of bourbon, chocolate malts, and the characteristic Storm King hopped-stout aroma with some booze coming through. Very pleasing on the nose. Taste upfront is of super-roasted malt bitterness, with hints of bourbon surfacing from start to finish. Slight wood (oak) notes towards the finish. After taste is slightly bitter, not overwhelming though. Pleasant tasting beer, and easy to drink. The alcohol is very well hidden. Medium bodied stout, a little more body would have surely elevated it a notch. Overall, this is a good barrel-aged RIS and another winner from Victory. Definitely worth a try and would surely recommend it. black pour with a dark tan head that raises up to 4 fingers, retains well and leaves tons of lacing. aroma is of bourbon, molasses, brown sugar, soy sauce, dark cacao, vanilla, and plenty of licorice that reminds me of the base beer. more chocolatey than the aroma with a touch of charred malts and a bit more subtle bourbon. licorice, molasses, dark fruits (raisins especially), and vanilla are evident as well. tasty. maybe a touch too strong in the licorice flavors, and could use a bit more cacao, though thats being nitpicky. a touch lighter bodied than ideal with subtle carbonation which suits the style nicely and a significant burn on the swallow. drinks pretty well. the first few sips blew me away. each subsequent sip was a bit of a letdown. It seems stronger than the stated ABV. Its a wonderful beer, but falls just shy of the epitome of the style. This one starts out as expected, with a standard opaque brown imperial stout color and a thinnest beige head. The aroma is nice but again expected, with a deeply roasted malt bitterness and an earthy combination of hops and wood. The flavor shines a bit more, with the deep, rich, roasty malt backbone meshing well with an earthy, herbal, and sometimes almost spicy hop character. Instead of just adding a whiskey flavor on top of this profile, the barrel aging imparts a nice woodiness that again meshes well with the base beer's characteristics. The taste of the alcohol is there, but without much of the straight alcohol burn, which makes this one drink relatively easy. Overall, this still isn't one that I could tolerate drinking for extended periods, but I was quite enjoyable as a brief experience. Poured from a bottle of 2011 vintage into a snifter, the beer is an extremely dark brown, almost black in the depths, with a dark, chocolatey brown ring of film around the surface. A slight, dark brown film coats the glass on a swirl, but recedes fairly quickly. Aromas are heavy in oak, both wood and earth, with a heavy booze overtone and a good background of dark coffee and rich, molasses sweetness. The wood and booze dominate the nose. The beer is sharp in mouth, with booze and coffee bombarding the forward tongue and palate. Super rich and dark cocoa nib throughout the background, with an earthy and woody blending. The aftertaste is more of a burnt coffee bitter and roasting, as well as a rich, dark chocolate and booze heavy backbone. The finish is borderline smokey, with a charred bitterness and a slight cloying in mouth. Strong brew, and very tasty. Not for the faint of heart. Very interested to see how this tastes in a couple of years. 750ml bottle (bottled on Nov 10, 2011) courtesy of hoppymcgee, poured into a Brooklyn snifter. A - After a lite pop of the cork, this one pours a thick near black but still distinctly brown color with a huge three finger pillow of fluffy chocolate milk shake-like head. Foam has excellent staying power, only giving up after several minutes and leaving behind sticky webs of lace on the glass. S - Dark fruits take the lead in the aroma. Lots of berries and some cherry add to the overall fruity aroma. Noticeable sweet aroma of alcohol, notes of bourbon, some roasted malts but at a lower level of intensity. T - Bitter roast malt, some coffee, touch of smoke, bourbon is more prominant in the flavor while the fruity aspects move into the background. Quite a bit more hoppy than the aroma suggests also. Finishes crisp, bitter and towards the dry side with some green, grassy hop flavors lingering into the aftertaste. M - A bit on the thin side, perhaps only managing a medium level body. Carbonation is healthy and mid-level as well. Alcohol is rather well hidden. Bourbon is really on the backburner of intensity...only contributing a mild flavor component and really no booziness or warmth. O - Overall, a good but not great RIS...barrel treatment is subtle leaving me wanting a bit more character added. I think I like the un-barreled Storm King a little bit better. This is well balanced but only lightly nuanced and just seems to be missing something that leaves this less than complete.